This follows with a graphic of Florida. This implies that people in Southern Florida should take in account a 6 metre (236 inch) rise in sea levels as a result of President Trump’s decision. Does this implied claim stack up. As in the previous post, let us take a look at Climate Interactive’s data. Without policy, Climate Interactive forecast that US emissions without policy will be 14.44 GtCO2e, just over 10% of global GHG emissions, and up from 6.8 GtCO2e in 2010. At most, even on CIs flawed reasoning, global emissions will be just 7% lower in 2100 with US policy. In the real world, the expensive job-destroying policy of the US will make global emissions around 1% lower even under the implausible assumption that the country were to extend the policy through to the end of the century. That would be a tiny fraction of one degree lower, even making a further assumption that a doubling of CO2 levels causes 3C of warming (an assumption contradicted by recent evidence). Now it could be that every other country will follow suit, and abandon all climate mitigation policies. This would be a unlikely scenario, given that I have not sensed a great enthusiasm for other countries to follow the lead of the current Leader of the Free World. But even if that did happen, the previous post showed that current policies do not amount to very much difference in emissions. Yet let us engage on a flight of fancy and assume for the moment that President Trump abandoning the Paris Climate Agreement will (a) make the difference between 1.5C of warming, with negligable sea-level rise and 4.2C of warming with the full impact of sea-level rise being felt (b) 5% of that rise. What difference will this make to sea-level rise? The Miami-Dade Climate Change website has a report from The Sea Level Rise Task Force that I examined last November. Figure 1 of that report gives projections of sea-level rise assuming the no global climate policy. Taking the most extreme NOAA projection it will be around the end of next century before sea-levels rose by 6 metres. Under the IPCC AR5 median estimates – and this is meant to be the Climate Bible for policy-makers – it would be hundreds of years before that sea-level rise would be achieved. Let us assume that the time horizon of any adult thinking of buying a property, is through to 2060, 42 years from now. The NOAA projection is 30 inches (0.76 metres) for the full difference in sea-level rise, or 1.5 inches (0.04 metres) for the slightly more realistic estimate. Using the mainstream IPCC AR5 median estimate, sea-level rise is 11 inches (0.28 metres) for the full difference in sea-level rise, or 0.6 inches (0.01 metres) for the slightly more realistic estimate. The real world evidence suggests that even these tiny projected sea level rises are exaggerated. 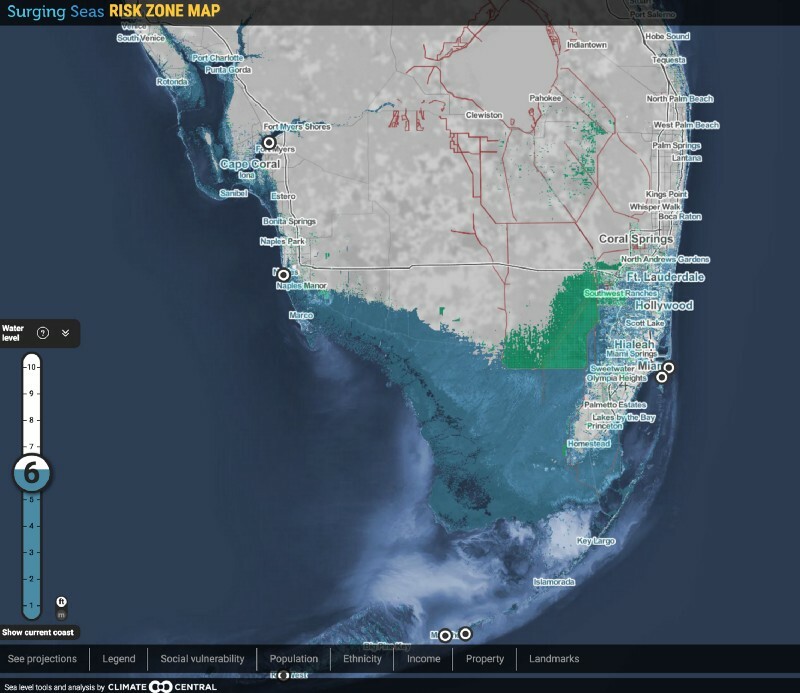 Sea tide gauges around Florida have failed to show an acceleration in the rate of sea level rise. For example this from NOAA for Key West. 2.37mm/year is 9 inches a century. Even this might be an exaggeration, as in Miami itself, where the recorded increase is 2.45mm/year, the land is estimated to be sinking at 0.53mm/year. If people based their evidence on the real world, President Trump pulling out of the Paris Climate Agreement will make somewhere between zero and an imperceptible difference to sea-level rise. If they base their assumptions on mainstream climate models, the difference is still imperceptible. But those with the biggest influence on policy are more influenced by the crazy alarmists like Joe Romm. The real worry should be that many policy-makers State level will be encouraged to waste even more money on unnecessary flood defenses, and could effectively make low-lying properties near worthless by planning blight when there is no real risk. Joe Romm promotes a myth that the Paris Climate Agreement will make a huge difference to future greenhouse gas emissions. Below I show how the modelled impact of think tank Climate Interactive conclusion of a large difference is based on emissions forecasts of implausible large emissions growth in policy countries, and low emissions growth in the non-policy developing countries. In the previous post I looked at how blogger Joe Romm falsely rebutted a claim that President Donald Trump had made that the Paris climate deal would only reduce only reduce future warming in 2100 by a mere 0.2°C. Romm was wrong on two fronts. He first did not check the data behind his assertions and second, in comparing two papers by the same organisation he did not actually read the explanation in the later paper on how it differed from the first. In this post I look at how he has swallowed whole the fiction of bogus forecasts, that means the mere act of world leaders signing a bit of paper leads to huge changes in forecast emissions. The reference scenario is RCP8.5, used in the IPCC AR5 report published in 2013 and 2014. This is essentially a baseline non-policy forecast against which the impact of climate mitigation policies can be judged. The actual RCP website produces emissions estimates by type of greenhouse gas, of which breaks around three-quarters is CO2. The IPCC and Climate Interactive add these different gases together with an estimate of global emissions in 2100. Climate Interactive current estimate as of April 2017 is 137.58 GtCO2e for the the reference scenario and the National Plans will produce 85.66 GTCO2e. These National would allegedly make global emissions 37.7% than they would have been without them, assuming they are extended beyond 2030. Climate Interactive have summarized this in a graph. To anyone who actually reads the things, this does not make sense. The submissions made prior to the December 2015 COP21 in Paris were mostly political exercises, with very little of real substance from all but a very few countries, such as the United Kingdom. Why it does not make sense becomes clear from the earlier data that I extracted from Climate Interactives’ C-ROADS Climate Simulator version v4.026v.071 around November 2015. This put the RCP8.5 global GHG emissions estimate in 2100 at the equivalent of 139.3 GtCO2e. But policy is decided and implemented at country level. To determine the impact of policy proposal there must be some sort of breakdown of emissions. C-ROADS does not provide a breakdown by all countries, but does to divide the world into up to 15 countries and regions. One derived break-down is into 7 countries or regions. That is the countries of USA, Russia, China and India, along with the country groups of EU27, Other Developed Countries and Other Developing Countries. Also available are population and GDP historical data and forecasts. Using this RCP8.5 and built-in population forecasts I derived the following GHG emissions per capita for the historical period 1970 to 2012 and the forecast period 2013 to 2100. Like when I looked at Climate Interactives’ per capita CO2 emissions from fossil fuels estimates at the end of 2015, these forecasts did not make much sense. Given that these emissions are the vast majority of total GHG emissions it is not surprising that the same picture emerges. In the USA and the EU I can think of no apparent reason for the forecast of per capita emissions to rise when they have been falling since 1973 and 1980 respectively. It would require for energy prices to keep falling, and for all sectors to be needlessly wasteful. The same goes for other developed countries, which along with Canada and Australia, includes the lesser developed countries of Turkey and Mexico. Indeed why would these countries go from per capita emissions similar to the EU27 now to those of the USA in 2100? In Russia, emissions have risen since the economy bottomed out in the late 1990s following the collapse of communism. It might end up with higher emissions than the USA in 1973 due to the much harsher and extreme climate. But technology has vastly improved in the last half century and it should be the default assumption that it will continue to improve through the century. It looks like someone, or a number of people, have failed to reconcile the country estimate with the forecast decline in population from 143 million in 2010 to 117 million. But more than this, there is something seriously wrong with emission estimates that would imply that the Russian people become evermore inefficient and wasteful in their energy use. In China there are similar issues. Emissions have increased massively in the last few decades on the back of even more phenomenal growth, that surpasses the growth of any large economy in history. But emissions per capita will likely peak due to economic reasons in the next couple of decades, and probably at a much lower level than the USA in 1973. But like Russia, population is also forecast to be much lower than currently. From a population of 1340 million in 2010, Climate Interactive forecasts population to peak at 1420 million in 2030 (from 2020 to 2030 growth slows to 2 million a year) to 1000 million in 2100. From 2080 (forecast population 1120) to 2100 population is forecast to decline by 6 million a year. The emissions per capita for India I would suggest are far too low. When made, the high levels of economic growth were predicted to collapse post 2012. When I wrote the previous post on 30th December 2015, to meet the growth forecast for 2010-2015, India’s GDP would have needed to drop by 20% in the next 24 hours. It did not happen, and in the 18 months since actual growth has further widened the gap with forecast. Similarly forecast growth in GHG emissions are far too low. The impact of 1.25 billion people today (and 1.66 billion in 2100) is made largely irrelevant, nicely side-lining a country who has declared economic growth is a priority. As with the emissions forecast for India, the emissions forecast for other developing countries is far too pessimistic, based again on too pessimistic growth forecasts. This mixed group of countries include the 50+ African nations, plus nearly all of South America. Other countries in the group include Pakistan, Bangladesh, Myanmar, Thailand, Indonesia, Vietnam, Haiti, Trinidad, Iraq, Iran and Kiribati. There are at least a score more I have omitted, in total making up around 42% of the current global population and 62% of the forecast population in 2100. That is 3 billion people today against 7 billion in 2100. A graph summarizing of Climate Interactive’s population figures is below. This can be compared with total GHG emissions. For the USA, the EU27, the other Developed countries and China, I have made more reasonable emissions per capita estimates for 2100. 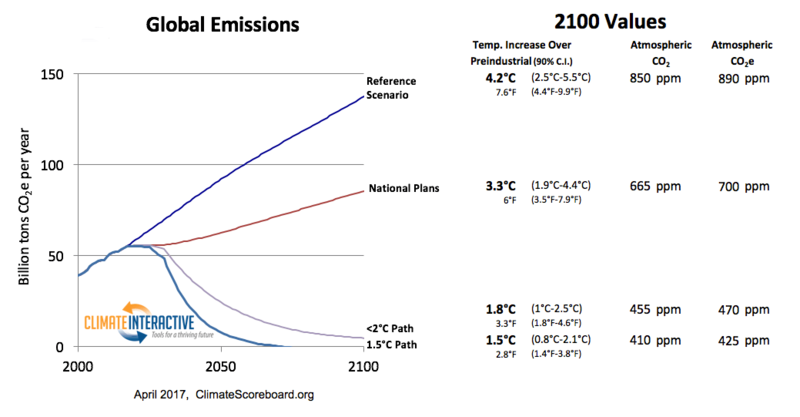 These more reasonable estimates (assuming there is no technological breakthrough that makes zero carbon energy much cheaper than any carbon technology) produce a reduction in projected emissions of the same order of magnitude as the supposed reduction resulting from implementation of the National Plans. However, global emissions will not be this level, as non-policy developing nations are likely to have much higher emissions. Adjusting for this gives my rough estimate for global emissions in 2100. The overall emissions forecast is not very dissimilar to that of RCP8.5. Only this time the emissions growth has shift dramatically from the policy countries to the non-policy countries. This is consistent with the data from 1990 to 2012, where I found that the net emissions growth was accounted for by the increase in emissions from developing countries who were not signatories to reducing emissions under the 1992 Rio Declaration. As a final chart I have put the revised emission estimates for India and Other Developing Countries to scale alongside Climate Interactives’ Scoreboard graphic at the top of the page. This clearly shows that the emissions pathway consistent the constraining warming to 2°C will only be attained if the developing world collectively start reducing their emissions in a very few years from now. In reality, the priority of many is continued economic growth, which will see emissions rise for decades. the emissions per capita forecasts for China and Russia show implausibly high levels of emissions growth, when they show peak in a few years. the emissions per capita forecasts for USA and EU27 show emissions increasing after being static or falling for a number of decades. the emissions per capita forecasts for India and Other Developing Countries show emissions increasing as at implausibly lower rates than in recent decades. The consequence is that by the mere act of signing an agreement makes apparent huge differences to projected future emissions. In reality it is folks playing around with numbers and not achieving anything at all, except higher energy prices and job-destroying regulations. However, it does save the believers in the climate cult from having to recognize the real world. Given the massed hordes of academics and political activists, that is a very big deal indeed. In the previous post I promised to provide some clear illustrations of the climate of this policy nonsense in Britain. The United Kingdom has a rather strange constitution, where three of the four countries have devolved assemblies, but largest with 83% of the population does not. The most vocal by far is the Scottish Assembly lead by Scottish Nationalist First Minister Nicola Sturgeon. The United Kingdom has the world’s most strident Climate legislation in the form of the Climate Change Act 2008. The Scottish Nationalists seek to differentiate themselves from the English by usurping the British role of leading the world on Climate Change. Scotland is therefore a useful place to look for the most extreme examples. Zero Waste Scotland, a Stirling-based company Limited by Guarantee, almost entirely funded by the Scottish Government, exists to promote environmentalist propaganda. In their words . Your food does its job best when it’s on a plate ready to be enjoyed. Saving food saves money and helps to slow down global warming and deforestation. Reducing the amount of food that ends up in the bin also means you can say goodbye to unnecessary packaging waste. If we all make a few small changes and start using up the food we buy, together we can make a big difference. Note all the Scottish people will take up the call from the website. Indeed, very few will likely visit the webpage, particularly those who are not already . Domestic food waste is less than the total food waste. There is waste in farming, food processing, restaurants, schools and retailing. Food Waste is a only a small part of total Scottish emissions. Zero Waste Scotland estimates 1.5 millions tonnes of 75 millions tonnes. Scottish emissions of 75 MtCO2E are a small part of global greenhouse emissions of 54000 MtCO2. The slow-down if all readers of the website and reduce food waste to zero in slowing global warming (assuming the link between warming and GHG less) is much less than 0.0028% of the total. Will people save money and reduce packaging waste by eliminating food waste? I believe that a cheap healthy diet for a family. I always tried to provide fruit and fresh vegetables for my growing children, as against cakes and ice-cream. With growing children, getting them to eat vegetables was a problem. Cabbage, leaks and mange tout were least successful. Corn on the cob was successful for a while. But we rarely had tinned of baked beans, which were popular. With fruit, some got left depending on the mood, and other foods eaten. Peels and cores added to the waste, along with the unsightly bits of cheaper potatoes and residue of roast chicken, leg of lamb and pork shoulder. (We are not keen on the fat, nor soup made from the stock). We could have saved waste by spending more on quality, or reduced waste by careful planning. For hard-working families there are other considerations. On a weekly shop it is a case of chucking some things in the trolley that will provide quick meals. Detailed planning of meals and careful preparation is sacrificed for family time, relaxation and sleeping. In terms of focusing on food waste could cause other harms, like failing to provide a varied diet to children and maybe spending more. The loss of leisure and family time are potential non-monetary costs. Zero Waste Scotland gets a 10% reduction from the 5.5 million people in Scotland, that is just 0.00028%, But the people reading are individuals, and maybe decision-makers for the families. A family going from average to zero food waste might reduce global emissions by 0.000000001%. Imagine is a business making such a grossly misleading claims in the benefits, and hiding of potential harmful side-effects in promoting say, vitamins. They would be prosecuted. But this is not a business selling a product but environmentalist propaganda. However, there are benefits to the Scottish Government. First, by having fancy websites, along with signage all over the place, they can claim they are combating climate change. This enables First Minister Sturgeon being able to dream of being making serious speeches to the UN and being photographed next to other world leaders. Further, this messaging changes peoples perceptions, meaning that anybody who perceives the absurdity is met by incomprehension and a string of half-learnt mantras. Without imposing censorship, in the name of “saving the planet” this promotes a progressive consensus that cannot be challenged. Third, there are British Government and EU targets to reduce food waste and other environmental concerns. When persuasion does not work, there is greater justification in providing incentives to promote “better” behaviour, as with banning smoking in public places, minimum price for alcohol and a awkward charging for plastic bags. Alternatively by taking some of the decision-making powers about what people eat and how they live their lives out of their hands and placing under the guidance of those who know better. They Scottish Government already tried this with the named person child protection scheme. Fourth, by out-sourcing (or privatizing) political propaganda, the SNP can avoid the claim of using the Scottish Government website for promoting a political hegemony. My General Election forecast made less than 12 hours before the polls opened yesterday morning was rubbish. I forecast a comfortable majority of 76 for the Conservatives, when it now looks like there will be a hung Parliament. That my central estimate was the same as both Lord Ashcroft‘s and Cerburus at Conservative Women is no excuse. In fact it is precisely not following general opinion, but understanding the real world, that I write this blog. What I have learnt is that the social media was driving a totally different campaign that was being reported in the other media. The opinion polls started to pick this up, and all sensible people did not believe it. Personally I was partly blind to the reality, as I cannot understand why large numbers of people should vote in numbers for an extreme left political activist who has over many years has sided with terrorists. Or a prospective Home Secretary who once voiced support for terrorism, and is unrepentant about that support. But then, in Paris 2015 leaders of the Western World voted for a Climate Agreement to cut global emissions, when that very Agreement stated it would do no such thing. The assessment of achievement was in the enthusiasm of the applause for the world leaders, rather than comparing objectives with results. That means comparing the real data with what is said. Blaming austerity on the Tory Government, when the current structural deficit is a legacy of Gordon Brown’s Golden Rule. Given that Gordon Brown is a Scottish Progressive, it something that the SNP needs to confront as well. Blaming rise energy bills on the Energy Companies, when it is a result of the Climate Change Act 2008. When Ed Miliband launched the policy at the Labour Party Conference in 2013, it was seen as something of the left extremism. But the Conservatives put such controls in their manifesto as well. Blaming the rising cost of pensions on increased longevity, when a major part of the reason is near zero interest rates on savings. Part of that blame is for the rise is the spin doctors, who only put out messages that will be well received by the target voters, and keep in the background areas where the target voters are split in their views. The Conservative manifesto and Theresa May’s election campaign could be seen as the inheritors of these 1990s New Labour doctrines. The Labour Party, however have rejected New Labour Blairism. In one sense Labour have retrogressed, with mass rallies that hark back to era when the British socialist party was in the ascendancy. But in another way Labour grassroots have embraced the new technology. We have a new way of communicating ideas based on a picture and 140 characters that takes power away from a few professional manipulators of public opinion. That power now rests with alpha trolls or non-entity celebs with their shallow views supported by isolated facts. It is a sphere where excluding other opinions by changing the subject; or having the last word; or taking offence for upsetting their false perceptions; or claiming those with other opinions are either outright lying or are blinkered; or getting fanciful claims repeated thousands of times until they are accepted as though they were fact. There is a way out of this morass, that is the exact opposite of the Donald Trump method of out-trolling the trolls. It is by better understanding the real world, so that a vision can be developed that better serves the long-term interests of the people, rather than being lead by the blinkered dogmatists and alpha trolls. I believe that Britain has the best heritage of any country to draw upon for the task. That is a country of the mother of all Parliaments and of the country that evolved trial by a jury of one’s peers. It is a country where people have over the centuries broken out of the box of current opinion to produce something based on a better understanding of the world, without violent revolution. That was the case in science with Sir Issac Newton, Charles Darwin and James Clerk Maxwell. This was the case in economics with Adam Smith and in Christianity with John Wesley. But there are dangers as well. It is on the issue of policy to combat climate change that there is greatest cross-party consensus, and the greatest concentration of alpha trolls. It is also where there is the clearest illustration of policy that is objectively useless and harmful to the people of this country. I will be providing some illustrations of this policy nonsense in the coming days. This forecast turned out to be widely incorrect. In a follow-up post I try to explore why it was incorrect. The major mistake I believe was to bend my forecast to a consensus of opinion. My follow-up post explores this further. In the past few weeks there have been dramatic swings in the opinion polls. As a result of which I felt unable to update my forecasts. Although the Conservatives have fallen in the polls, and Labour have risen, it is a very inconsistent picture. One Yougov poll had Labour only one point behind the Conservatives. Yet Atul Hatwal at Labour Uncut believes from the canvassing returns, the Labour Party is in for a nuclear winter outside of London. Start with the absurd. I use uniform swings – but by region – updating the post of 22nd May, with the forecast for a Tory majority of 28. Kept the assumption of a Conservative revival at the expense of the SNP in Scotland, but with Labour now only slightly down on 2015. Assume that Labour are doing very well in London. Assumed that in Labour constituencies where UKIP were strong in 2015, half the UKIP vote would go Conservative, and some of the Labour voters would stay at home. That is across the North of England and in Wales I am assuming a drop in turnout, which will be at the expense of Labour. I have not made a general allowance for a drop in turnout. This could be significant given the appalling campaigns, and the weather forecast. Figure 2 is my best guess, by region, of the result of tomorrow’s election. This would give the Conservatives a majority of 76. This is much smaller than the forecasts in April, but much larger than that of even a week ago. The Conservatives gain seats in Scotland, the North, Wales and the West Midlands. Labour still manages over 200 seats. Whilst this is down on 2015, it is better than Micheal Foot did in 1983, and the share of the popular vote is still around 35%, which could be higher than the share Tony Blair achieved when he won the General Election in 2005. The part of the forecast where I will be closest is the seats with no change. A quick look at other forecasts. Lord Ashcrofts’ constituency estimate is for majorities between 48 and 78. These are probabilistic estimates, so will not identify actual seats. The Telegraph have published Chris Hanretty’s estimate of a 100 seat majority. Hanretty did some excellent work on the EU referendum, which I have utilized in a number of posts. Who knows what tomorrow will bring. But having crude figures by constituency I can compare forecast with actual. Lord Ashcroft’s final estimates were published at 15.45 at Conservative Home. His central “combined probabilistic estimate” of 363 Conservative seats, giving a majority of 76, is exactly the same as mine. We differ on the other parties, as I am assuming Labour will do worse in their Northern heartlands, where disillusioned voters in the Brexit areas will stay at home. The Lib-Dems and Plaid Cymru I assume will do better due to strong local support. Will Jeremy Corbyn change his Shoot to Kill Policy? LK : If we saw the kind of horror in Paris here if you were Prime Minister would you order security services onto the streets to stop being killed. JC : Of course you bring people onto to the streets to stop people being killed, to prevent and ensure there is safety within our society, but its much better that it is done by the Police than security services, but it is much better we have strong and effective community policing; neighbourhood policing; and a cohesive society that brings people together. Obviously that is essential so that is one of the messages that I will be putting to the Prime Minister. LK : But if you were Prime Minister would you be happy to order people – police or military – to shoot to kill on Britain’s streets? JC : Err, I would , I am not happy with a shoot to kill policy in general. I think that is quite a dangerous – and I think it can often be counterproductive. I think that you have to have security that prevents people firing off weapons where you can. There are various degrees of doing things as we know. But the idea that you end up with a war on the streets is not a good thing. Surely you have to work to try to prevent these things happening. That’s got to be the priority. So when terrorists are rampaging on the streets, killing and maiming people, Prime Minister Corbyn will be unhappy for police officers to shot them dead to protect the innocents. With that policy, I am sure the lives of the terrorists could have been saved last night. But not before they had killed and injured quite a few more. So potential jihadists will know that if they do launch a terror attack, it will not necessarily be a suicide mission, and they will be able to bag a few more infidels before being overpowered by community police officers. By the same line of thinking, if horror of horrors, negotiations failed in a nuclear war, and an aggressor unleashed its missiles against us, Prime Minister Corbyn would be unhappy launching a retaliatory strike. In doing so he would no doubt save millions of lives in aggressor country. Knowing Prime Minister Corbyn’s pacifism and dithering, would be aggressors will be emboldened to flex their muscles. But it gets worse. This is what the Guardian wrote about Jeremy Corbyn in 1996. Every few years, the London Labour MP Jeremy Corbyn indulges his romantic support for Irish republicans by using his parliamentary privileges to give them a publicity platform. These occasions always also provide a showcase for Mr Corbyn’s abiding qualities: his lack of wider political and moral judgment, his predilection for gesture politics, his insensitivity to the feelings of most Londoners and his indifference to the policies of his party… Mr Corbyn’s actions do not advance the cause of peace in Northern Ireland and are not seriously intended to do so. It is surprising that a politician as clever and important as the Sinn Fein leader should be bothered with him. Grown-up people ought to keep this childish sideshow in perspective. Mr Corbyn is a fool, and a fool whom the Labour Party would probably be better off without. When dealing with the problems of Northern Ireland, Jeremy Corbyn spoke to Sinn Fein. In so doing the political wing of a terrorist organisation were able to gain ground at the expense of the peaceful Social Democratic and Labour Party. Similarly he called the terror groups Hamas and Hezbollah friends, helping them to legitimacy at the expense of more moderate and peaceful representatives of the Palestinian people. The people who should be most afraid of a Prime Minister Corbyn are those in the Muslim Community who want to live peacefully in a free country. This I believe is the vast majority of the Muslim community. Corbyn is drawn to the noisy and ideological types, who hate liberal democracy for something more akin to Saudi Arabia. Another group are who should be afraid are members of the LGBT community, given what Islamic ideology has to say about homosexuality. The Jewish community are clearly afraid. Whilst a few years ago a majority supported Labour, around 13% do so now. One of the wonderful things about our liberal democracy is that people have a secret ballot. The vote is between them and their conscience. Jeremy Corbyn is well-meaning, but is a dangerous fool. He should not be trusted with the highest office in the Mother of all Parliaments by anyone who believes in diversity and freedom to practice ones own beliefs. Whilst I was writing this, Jeremy Corbyn announced that he now supports a shoot-to-kill policy. But the first action as Prime Minister will be to commission a report on the changing nature of the terrorist threat. He views the ways of making a more effective police force is more numbers and higher pay. Nothing about improving the quality of service, and stopping unnecessary bureaucratic hindrance. There is also nothing about listening to those with mainstream democratic views in preference to the anti-democratic extremists. Corbyn then quickly changes the subject. Banksy trying to bribe voters through a legal loophole? The BBC has an article Banksy makes election print-for-vote offer. Secretive artist Banksy has offered fans a free print if they vote against the Conservatives in a move which could land him in legal trouble. The political graffitist posted on his website offering a print to voters in six Bristol area constituencies. Applicants have to send him a ballot paper photo showing a vote against the Tories to get the limited edition work. This would contravene laws designed to ensure votes remain secret, and could break rules against bribery. Lawyer’s note: this print is a souvenir piece of campaign material, it is in no way meant to influence the choices of the electorate, has no monetary value, is for amusement purposes only and is strictly not for re-sale. Terms and conditions to follow, postage not included. I will leave it up to the Electoral Commission to decide the legality of Bansky’s offer. But the terms in the small print shows a delusion of the left. Simply by declaring that something “has no monetary value” and is “for amusement purposes only” does not mean that the print is not valuable to the recipient. For instance, experiences in my life have no monetary value, but I value them highly. In this respect the offer of a print for not voting Conservative could be viewed the same as a similar offer of being able to meet a famous person that the voter admires. What most people would agree upon is that some of the most valuable things in life have no monetary value, such as love, friendship or the bonds of family. The left have always been keen to emphasize that by creating monetary values, capitalism distorts these real values. It is therefore somewhat hypocritical for someone of the left to circumvent the law on bribing voters by offering a reward for voting in a non-monetary way, That is by trying to legally demonstrate that there is no bribe by declaring it has no monetary value, when to the genuine left-wing voters it is more valuable due to declared monetary value. The only defense if that those of the genuine left would never vote Conservative anyway. But that means that any offers for sale on Ebay of the prints are evidence that someone maybe changed their vote to get a print. Alternatively, as most people agree that some things without monetary value are still valuable, including Conservative voters it could still be valuable. The intellectual left view Tories as being of lower morals, particularly looking after their selfish interests. In this respect maybe someone who would normally vote Conservative will vote for a non-Conservative outsider, to get the print. I am sure that Banksy feel able to stand up in court, under his real name, and proclaim under oath that no Conservative would stoop to such an action. I am just as sure that Corbinysta twitter trolls will be queuing up with their Twitter histories to affirm that they have never implied anything other than that Conservatives were on a similar level of morals to themselves. Just to clear, Banksy might be within the law. But it would appear to be rank hypocrisy from a left-winger to offer something that is declared without a monetary value, but clear non-monetary value, when most people agree – particularly of the left – that many things with a non-monetary value are in fact valuable to them. Guido Fawkes reported yesterday that Banksy has withdrawn this “bribe”.